I begin my post this time with a short testimony about myself. Everyone who didn’t know me very well always said that I am a perfect woman. They said that I have inner and outer beauty, have an established life, have great charisma, and many more. Right now, unashamedly I am going to tell all of you that in fact, everything that they said about me was not entirely true. As a human being, I also have a weakness. I have congenital defect. Since age of 3 months, I have impaired hearing function. As a result, to remain be able to hear I have to use a hearing aid until now. This is what I mean as my weakness. No matter how sophisticated the hearing aid that I use, it still has limitations. I am still not being able to hear sound very well like others who have normal ears. There are specific sound frequencies that I couldn’t hear very well. A high tech hearing aid still cannot replace the perfect natural hearing instrument that created by God. When I have to accept the fact should use a hearing aid, another serious problem comes. I had low self-esteem problem. I am embarrassed because I felt different with other children. I felt different because to hear well I have to use hearing aid. Then I was isolating myself from my neighborhood. At that time, I felt my body is incomplete. Though I have ears but I felt didn’t have it because not functioned properly. This problem was continued until few years. My dear friends, here we talk about human weakness. I do believe that many people in this world have a weakness, whatever it is. Maybe we have physical weakness such as has a disability like me. We may have mental weaknesses like trauma, emotional instability, paranoid, or maybe we have intellectual and intelligence weakness and that weaknesses raises serious problems. We could be of inferiority, introvert, touchy, and difficult to develop self-esteem. We also tend to always focus on our weakness and doubt the abilities that actually we have. If we look at the Bible, there are several events that illustrate the lack of confidence to do things in accordance with the God-given task. The reasons such as physical weaknesses and limitations, too young, and other reasons that made them doubted their own ability. Though God has been said so firmly, the mist of doubt still covered his eyes and heart so he could not clearly catch the point of God’s answer. 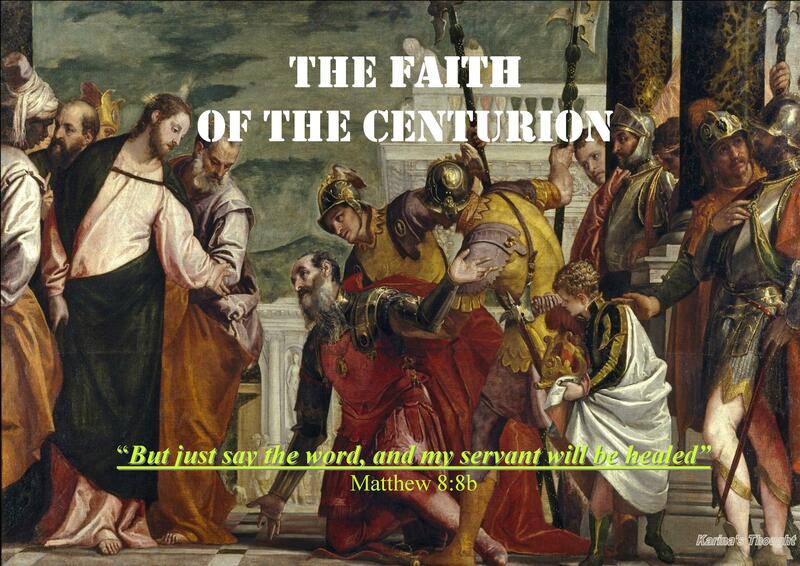 Then he said: “Pardon your servant, Lord. I have never been eloquent, neither in the past nor since you have spoken to your servant. I am slow of speech and tongue.” (Exodus 4:10 NIV) Here, Moses spoke about his physical weakness and limitations. But let’s see what the God’s answer: “Who gave human beings their mouths? Who makes them deaf or mute? Who gives them sight or makes them blind? Is it not I, the Lord? Now go; I will help you speak and will teach you what to say.”(Exodus 4:11-12 NIV) Perhaps it was true that Moses had a weakness in speaking. Moses was not an orator or a politician who is fluent in speaking. He is also not a good poet. But Moses forgot one thing which becomes important thing: Not due of his capability, but only by the God’s power that makes him capable. Now back to myself for a moment. The encouragement word that had ever given by my father long time ago was so true. There is God’s power and love behind my weakness. Honestly, I really feel it until now. I feel how great God’s love and power within my disability. Though I have a hearing disability, actually God gave me another great ability. Doesn’t mean I am bragging, God gave me acuity of intuition, instinct, and very high sensibility in analyzing and solving a problem. I felt this way when I was 14. I am very sensitive to anything that might be causing the problem and if the problem really happened, I already know and prepared to solve it. God also gave me ability in read people’s mind only by looking the ways they talk. I am not saying that I have sixth sense or supernatural ability, but this is what I feel and I strongly believe all of that are only gifts from God. And later, these gifts are very useful to support my work. I am very grateful to God for such the great gifts and blessings and I felt these gifts could cover up my weakness that already becomes a burden for many years. That is why in my “About me” page, I mentioned that I am just an ordinary woman but with an extraordinary blessings from God. I realized that behind my physical weakness and limitations God’s power really works to enable me to run my big responsibility. This means that in doing something, actually not because of my capability but God’s power can make me capable to doing great work. Within our weaknesses, let’s come to God and hear his heart wishes. We will continue grow in strength, zest, and joy if we keep build close relationship with our Father in Heaven. Let the God’s power works within our weakness and limitation. Our weakness isn’t the end of everything. 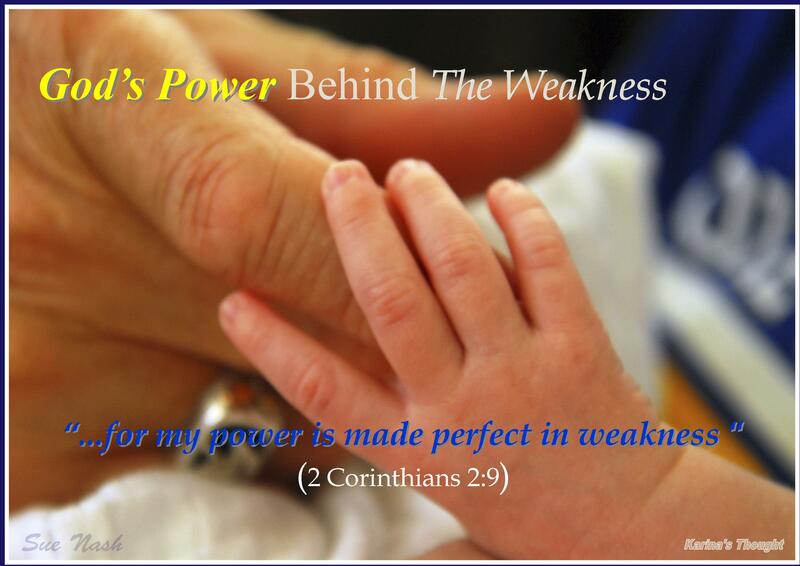 Bear in our heart that God ready to show His perfect power upon our weaknesses. Always remember that God did not create us in vain, or deliberately make us suffer. God has a wonderful plan for all of us. Remain be grateful and let’s prove that God’s power is able to change everything, even within our weaknesses and limitations. Let’s stop to only focus on our weaknesses and don’t let us drown in it, admit it, and feel how God’s power will be able to shine upon our weaknesses. God amazingly blessed us with another great ability. He is able to use us to declare His glory and God’s power will perfect in our weakness. Amen. The interesting thing from this parable is The Psalmist compares the righteous with the shoots that appear in the palm trees, and lush like a cedar in Lebanon. To capture the meaning and essence of this parable, let us first look at the character of both of these trees. First, let’s have a look on the palm tree. For the wanderers who walk in the dry and barren desert, it is uplifting thing if they see a palm tree. Why? Because if they meet the palm tree, so it means soon they will meet an oasis or water spring. There will be no a palm tree if there is no water spring around the tree. How does the palm tree can grow in the barren and dry desert? When the seeds of palm are planted, the fibrous roots will penetrate the ground to find and absorb the water. Even though the roots of palm tree do not penetrate too deep to the ground but each fiber of the roots will spread and gripping the ground so strong. That is why the palm tree could become a strong tree. The palm tree will be deeply rooted although not too deep. Now let’s take a look to the second tree, Cedars of Lebanon. Cedars are known to be very strong and not easily weathered. Getting older instead of being fragile, even the wood is getting stronger. The tree is also known to have a strong resistance to weather changes. No wonder at the time, cedars is often used for palace’s pillars and even the temple courts. In the book of Kings we can get a picture of this cedar tree. When Solomon built his palace, he mostly uses this cedar trees from Lebanon. So, the meaning of cedars parables are, we are as the righteous is expected to be strong person who can act as a pillar for the life of our fellow, and for the God’s glory. We have to become a strong person who not easily wavers in facing the severity of the life’s problems, not easily fragile facing the heavy storm of life. We have to still standing strong despite many world temptations trying to strike us. Based on the character of both of these trees we can see clearly that the Psalmist does not arbitrarily take a parable. There is a strong intent behind this parable. 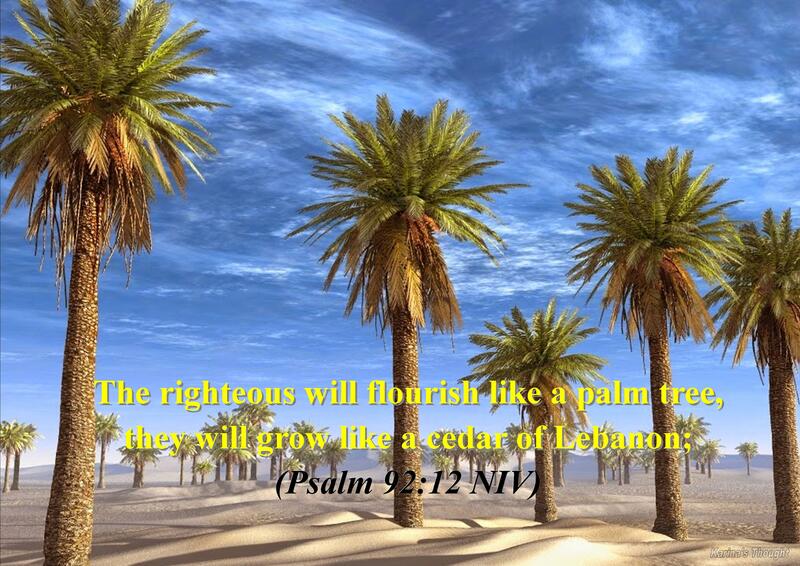 Palm trees and cedar symbolizes us as the righteous that live in Christ. We expected to have characters like both of those trees. Deeply rooted, able to overcome obstacles, continue growing, able to live in the midst of difficulties, able to bear fruit and become fresheners that bring joy to the people around us, then also be able to become a strong pole in life. When I read and ponder this parable, there are questions crossed in my mind. What about us now? As Christ followers, have we deeply rooted like palm tree and know where we have to get living spring water? Have we thrive and bear much fruit that gives joy and blessing to many people around us? Or whether in fact our life become like a dry and barren desert? Have we become a strong poles like cedars wood, growing with incredible strength? Or otherwise we are still easily wavering buffeted by wind, always unsteady and even someone else sustain us? Let’s pay attention to the verses above. Until three times Jesus the Lord mentions “remain in me” This means it is very clear to us that always remain in Him is the most important thing we have to do. To be fruitful and be a blessing to others, we have to live and deeply rooted in Christ. Without it, all just be in vain. That is what will bring us to the living water, water that will be given by Jesus which will not be able to make us thirst forever, become the water spring in Him who constantly welling up to eternal life. And when we bear much fruits we will glorify God. Our strength is limited and will decline, but we must remember that the power of God will never decrease. And God says ready to carry, bear and saved us up even though our hair graying. This is God’s promise. That is clear, God still has a plan even when we are old and weak, and God still wants to use us regardless of age and ability. My dear friends, let’s us encourage and pray one and another to always make effort and learning to have characters like palm and cedar tree by always live in God and the Holy Spirit. Always walks in the truth of God’s word and His will. Always maintain intimacy of our relationship with God. If our spiritual life begins dry and barren, immediately splash our spirituality with the living God’s word so we will continue to thrive and bear much fruit. Let God guiding and strengthen us in the forming process to be a person who have characters like palm and cedar tree. Do not rely on our own ability to become strong pole but be strong in God and in His grace. Amen.